Amit came to visit me a couple of weeks ago. On the weekend of his visit, we decided to go fishing. My tour book said that people can go fishing along the twin canals in La Fitte (pronounced la feet … always makes me laugh). We went to Academy sports, bought fishing poles and a fishing license for him. Then, we across the Huey P. Long bridge, picked up some shrimp for bait, and keep heading south towards the twin canals. When we arrived at La Fitte, we saw plenty of people fishing. We even saw an old man with a bamboo stick and fishing wire feed through it. I was quite impressed. We walked along the canal until we found our own little clearing along the bank. Looked perfect — or so we thought. We decided to first practice casting out. We attached the sinkers (weights) to our lines and cast them in the canal. Mine was stuck on something, so it took a bit of tugging, but I was finally able to start reeling it in. Still feeling resistance, all of a sudden, I see an alligator swimming towards me! The weight was in his mouth (or so I assumed)! Of course, I screamed and started running. Amit, looking like a deer in headlights, asked me what we are supposed to do. I was so panicked I could barely move or even talk, but somehow I managed to communicate the situation to him. After I regained composure, the alligator had disappeared and I reeled my line in just fine. I stood on top of the highest place I could find and was looking suspiciously all around. Amit, started to tell me that the next time an alligator is chasing me that I should run away from him instead of towards him. What a friend. Shaking, I pick up my gear and start to find a new place. Not quite believing my story, Amit convinces me that this other clearing will be just fine. There was a slight cliff into the water, instead of the gradual incline from where we were before. So, I agreed. Again, we cast out. Again, I caught an alligator. This time, Amit saw it. I think he was more scared than me … which then scared me even more. I dropped my fishing pole and ran away. 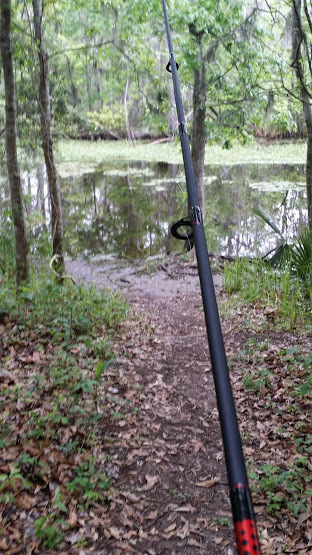 Luckily, my pole was pretty far from the edge, so I was later able to pick it up and reel in my line … after the alligator swam away of course. Needless to say, we didn’t catch any fish that day. Earlier this week, I went to the OMV (still seems strange it is not called a DMV) to get my Louisiana Driver’s License and to transfer the title of my car to Louisiana. The office opened at 8 a.m. I arrived around 8:20 a.m. Late, or so I’m told. I stood in line for about one hour before getting a ticket, so that I could sit to wait for my number to be called. Around 1:30, my number was still not called, and I noticed that people who arrived after me had already been served. I went up to a teller who told me to talk to the shift manager, at counter #10. I went there. His response: “There are people who were here way earlier than you and are still not served.” Relative to 1:30 in the afternoon, the difference between 8:00 and 8:30 is not huge, so I wonder if people spent the night at the OMV waiting to be served. Due to the way that they number things, you can tell why different people are at the OMV. People whose tickets began with a D (like mine, D316, numbering starting at 300), we had to title a vehicle. People whose tickets began with an E … they were getting their license reinstated. A girl who arrived at 11:00 with an E-ticket was served by 2:00, before me! I saw over 100 E’s pass through during the course of the day. Around quarter to 3:00, my number was finally called. Since they close at 4:00 and the last D before me was called at 1:45, I was beginning to lose hope at that point. Moreover, the batteries in both my ipad and my phone were about to die. At the counter, I was told that my car insurance was not faxed to her (it was!) So, I had to re-call my insurance company with a dying phone to ask them to re-fax the documents. Luckily, they could do that fast. Then, she tells me that it is going to be over $500, and asks “are you sure you want to do this?” I asked her what options I had. Drive a vehicle registered in a state where I don’t live? That would work until August, when the registration expires. Then what? Waste another day here at the OMV? That’s just postponing the inevitable. Since I didn’t have that much cash on me, I had to go across the street to the Winn-Dixie to buy myself some lunch and ask for cash back. (I had exceeded my daily limit on the ATM machine already). I don’t remember tasting the food I go there, I was so hungry. At the gas station, the guy tells me that I should have put on the plate myself. But, since he’s such a good guy, he’ll put it on for me if I give him a few dollars. He goes on about how difficult it is to change the license plates, and that some of them use this tool and some of them use that tool (he has both). Oh, and I have a bike rack, that’s going to be difficult to get around. Still, I tipped him to shut him up. We went outside, he scraped off my PA inspection stickers. He complained that this was more difficult than the Texas stickers. He puts on the new sticker and closes the door. I say, “what exactly do you check for in this inspection?” He tells me that it checks for the blinkers, the wipers, and the horn. Then, he looks at me and says “I know that the blinkers work.” (not sure why he knows that) “oh, and let’s check the horn.” He then opens the door and presses the horn. Did I just remind him to do his job? Also, why are these called brake tags if they don’t check the brakes? Last week, Natalie took the bus to Pittsburgh. She got up at the crack of dawn (probably before the sun rose) and arrived in Pittsburgh around lunchtime. My greeting was very hospitable — I put her to work packing my car with a tight deadline right away. Then, we picked up Dave from work, dropped him off at the airport, and headed South. We took off last Thursday afternoon, a week and two days ago now. We made it to Bardsville, Kentucky before calling it quits for the night. It was probably good that we stopped, as I almost fell asleep while in the shower shortly after arriving at our hotel. In the morning, we strolled around town, buying produce at the farmer’s market (and cabbage plants!). 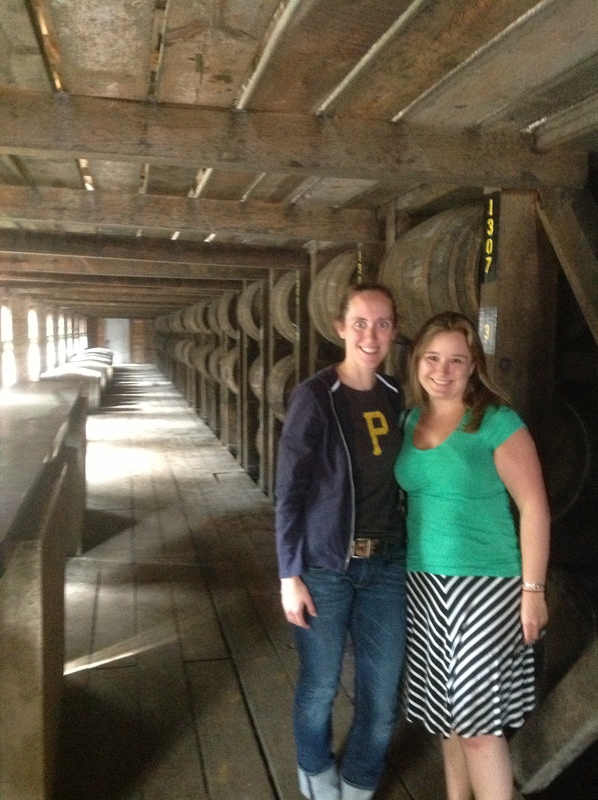 Then, we went to the 1792 Distillery, because starting a 9 hour road trip with bourbon samples is a good idea. The tour was actually pretty neat. There were two people on the tour with us who didn’t know what alcohol was or why people drank it, so that was a little strange. My favorite part was seeing one of the large sheds that housed the bourbon barrels. The ingenuity that went into designing this house is amazing. After the tour, I decided we must go to Nashville. And so we did. We had lunch at Arnold’s. This was everything I could hope from a stop in Nashville: true southern, bad-for-you food. I had some meat along with mashed potatoes and fried green tomatoes. It couldn’t get any better than that. 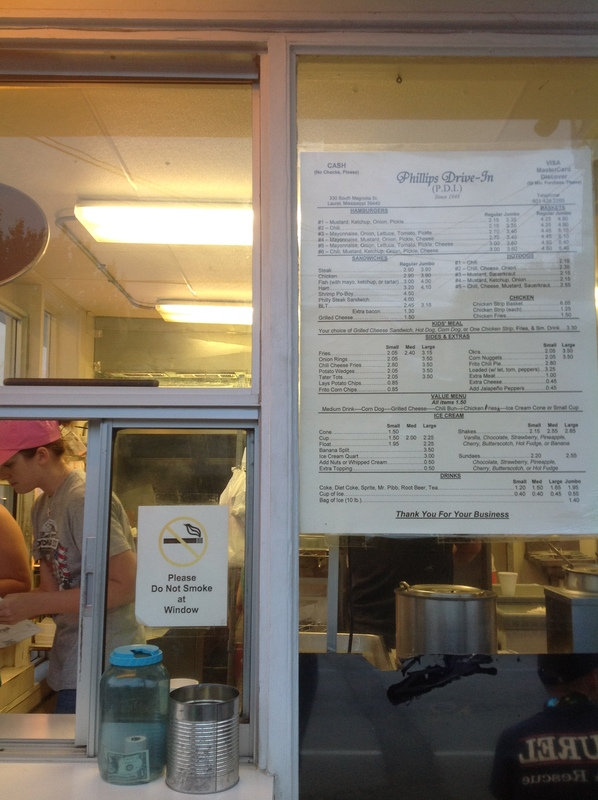 In Mississippi, we stopped at PDI (Philip’s Drive In) for dinner. I took a picture of the menu, as I don’t think you would believe the prices if I didn’t have proof. I had a delicious burger with tater tots!